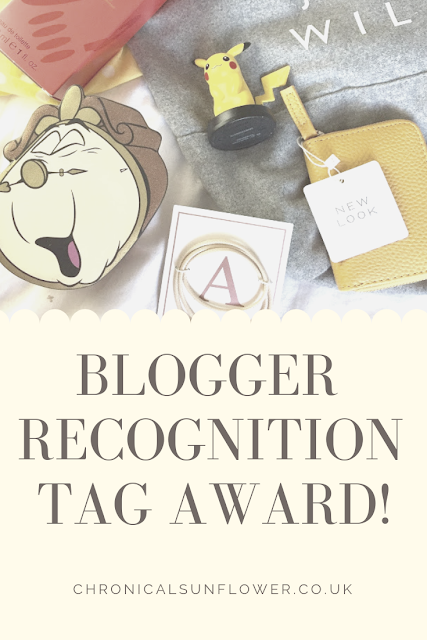 Thank you so much to Nadine Alex for tagging me to do the Blogger Recognition Award! *I, however, will not be choosing people randomly, and have asked people who would like to participate! I technically started this blog in 2010 (when I was 11 years old), however, I think at the time I wrote one blog post and then forgot all about it. In around 2013 I started writing again and although I've taken breaks, I haven't stopped since! I've always loved writing, when I was about 4/5 I used to sit and write loads of stories, I remember one being "Christopher the Monkey" which was based on my brother being a monkey, and I haven't stopped writing really. I always enjoyed it in school, especially when I was allowed to choose the topic of discussion. It's always been a passion of mine. Just write! It doesn't matter what the latest trends are, or who's writing what. But about what you enjoy, what you love and what you yourself would find interesting to read. I remember coming across a quote, I can't remember where that said "As a writer, we are constantly criticizing ourselves because of society. When really, something we may see as complete nonsense and not worth it, a reader may see as beautiful and worthwhile" so if you enjoyed writing something but believe it isn't worth it, someone out there will read it and enjoy it too. Another piece of advice; be prepared. I went into blogging with a name I thought of in 5 seconds, didn't read up on SEO and just started writing. And while that's still good, I changed my blog name constantly, alongside my social media and just didn't have a grasp on what I was doing. So think if a good blog name that signifies what you believe in or who you are as a person, do your research on websites to use, and SEO. Be prepared to go into the blogging world! Further to the last point, interact with your fellow bloggers! I find it really hard to with my anxiety but I still find it easy to leave comments/retweet blog tweets and/or comment on Instagram posts, as although it can help someone else, it can also help your own engagement. *If you'd like to do this yourself, go ahead and say I nominated you!